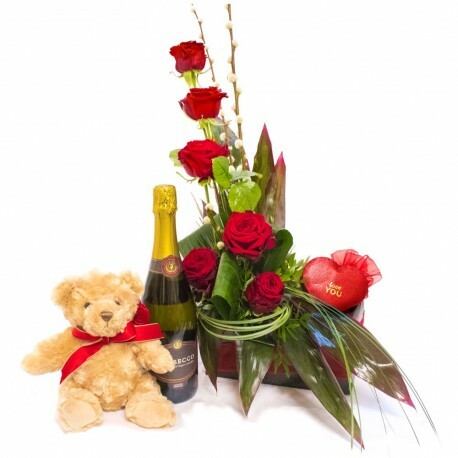 A beautiful red rose arrangement including a bottle of prosecco and a teddy bear. A great gift for Valentines day. the perfect alternative to a bouquet this arrangement is full of love. Made using stunning long stem red roses and glossy foliage this arrangement is surely a delight. Sent with a bottle of fizz and a cuddly friend this will make your valentine swoon! Why not add chocolates a balloon or both to your order to give this valentine’s day a super special touch. Saying be my valentine has never been so easy.